I love scarves. And I mean LOVE. I have so many. I’ve forced myself to purge my collection a few times, but I still have a huge basket of scarves in my closet. They are an easy way to turn a summer outfit into a fall or even winter outfit. Hello layers. When I travel, I always bring a scarf with me. Even when I’m going somewhere warm. Well, as I said above, I’m often cold. Everyone else could be wearing shorts and t-shirts and I’ll be all bundled up, shivering. As women, we feel cold more often because our bodies actually produce less heat than male bodies. So, in case the evening gets chilly, or the air conditioning is frigid, or I need to protect my unfortunately sunburned chest from continued sun exposure, I bring a scarf on every trip. I prefer a lightweight infinity scarf (I have a few in different colours), but all of these ideas can be done with a heavier weight scarf, a square or rectangular scarf or a blanket scarf. It’s an accessory, it completes an outfit, it means you don’t have to pack it, and it will keep you comfortably warm in airports, cars, airplanes, waiting rooms, and pretty much everywhere else. Check out this video from Wendy’s Lookbook of 25 Ways to Wear a Scarf. Ever been on a long flight or car ride and gotten chilly? Your legs or arms get cold (especially in summer when you’re typically wearing shorts or a skirt and short sleeves). Pull that scarf out and unfold it all the way to make a light blanket. Again, long travel days are exhausting. And travel pillows can be bulky or annoying to carry with you. They take up a ton of space! And if you’re like me, those curved neck pillows are not comfortable at all. So, fold up your scarf into a little rectangle, fluff it up, and ta-da ­– you have yourself a little pillow. Red eye flights aren’t much fun. Especially when your neighbour is like me and can’t sleep on a plane so instead reads by the light of the overhead lamp the whole night long. Or, you’re next to the lavatory and every time someone goes in or out, the bright light flashes and wakes you up. If you forgot your sleep mask (or don’t have one because there’s no other time you would use one), place your scarf over your eyes and forehead for a quick makeshift mask to block out that reading light so you can sleep. While not ideal, sometimes while travelling, the only place to sit is a little grimy and gross. Use your scarf as a seat cover for that gross looking bench. Just make sure you can wash it before you need to use it or wear it again. Picnics while travelling are a wonderful way to save some money, experience some free entertainment by people-watching. If your scarf is large enough, it can make a wonderful picnic blanket for a classy outdoor picnic. In the same vein as above, sometimes while travelling and eating your snacks or meals on the go, the tables at rest stops or in random touristy stops aren’t always super clean. Make your stop a little more appetizing by using your scarf as a table cloth. It’s not ideal, but sometimes you just need to wipe your hands (or your face) with something. Better to use a scarf than the hem of your t-shirt or smearing sauce remnants on the thighs of your pants. If you have super fair skin like me, five minutes in the sunshine can lead to a sunburn. While wearing sunscreen and saying in the shade as much as possible is ideal, when your skin starts to feel sensitive at the beach or on a hike, grab a light scarf to cover up your neck, back, or arms. If you don’t have a hat, you can even wrap the scarf lightly over your head to protect your forehead scalp (especially that part in your hair – those burns are no fun!). Lightweight scarves can be surprisingly useful at the beach. Wrap that scarf lightly around your hips to make a lightweight skirt, or if your scarf is long enough, wrap it and tie it around your torso and neck for a makeshift dress. Save your towel for drying off and use your scarf as a blanket to save your booty from the sand. Bought a few souvenirs but didn’t want to use more plastic shopping bags? Use your scarf as a bag. Check out this video tutorial from Jenny at Origami Tree. 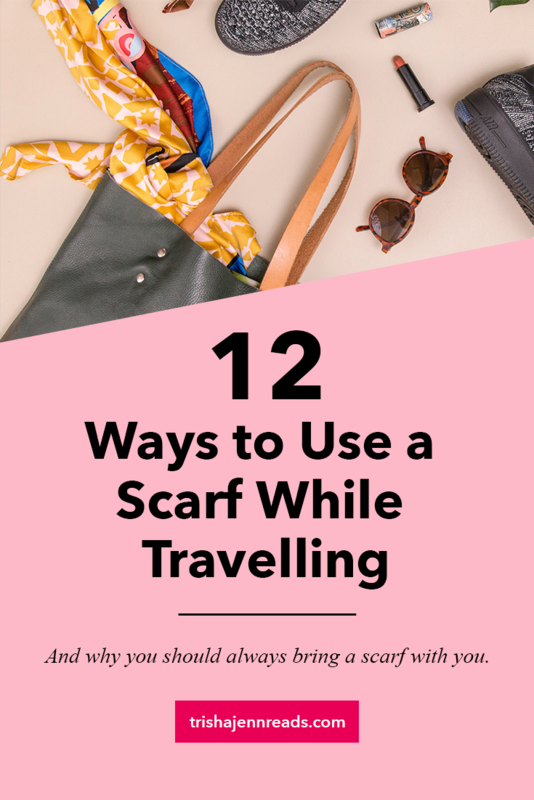 Can you think of any more ways to use a scarf while travelling?